1978. Those high loss rates were associated with hydrologic alterations which allowed salt water to penetrate the fresher marshes. During the transition to a more brackish plant community, large ponds were formed. A narrow strip of land separates those ponds from Lake Pontchartrain. Although the shoreline erosion rates are relatively low, the shoreline is already breached in several areas, and marsh loss in the interior ponds is expected to increase if the shoreline fails. The goal of this project is to re-create marsh habitat in the open water behind the shoreline. This new marsh will maintain the lake-rim function along this section of the north shore of Lake Pontchartrain by preventing the formation of breaches into interior ponds. 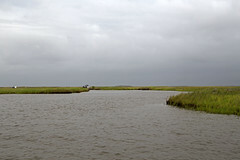 Sediment will be dredged from Lake Pontchartrain and contained in cells within the interior ponds to create approximately 417 acres of marsh. In addition, 149 acres of degraded marsh will be nourished with dredged material. Marsh will be created to widen the shoreline so that the ponds will not be breached during the course of normal shoreline retreat. The project is located on the north shore of Lake Pontchartrain between Fontainebleau State Park and Louisiana Highway 11 and within the Big Branch Marsh National Wildlife Refuge in St. Tammany Parish, Louisiana. The project area at Goose Point also includes a portion of the St. Tammany State Wildlife Refuge. On February 12, 2009, a final inspection of the project site was conducted. All construction activities are complete. This project is on Priority Project List 13.